Monarch Air Group provides private air charter in New Orleans, LA. Our clients benefit from top-notch service, unrelenting dedication to safety, wide selection of aircraft, and years of experience in chartering private jets. To obtain a free quote, please use our online quoting tool provided below, or call toll free 1-877-281-3051. Monarch Air Group offers private jet charter services to and from New Orleans, LA USA. Often called “The Big Easy”, New Orleans is the largest and most culturally diverse city in the state of Louisiana. 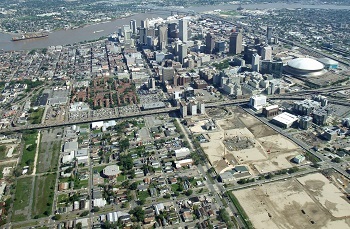 New Orleans sits about 30 ft. below sea level, situated on the banks of the Mississippi river. The perfect time to visit New Orleans is during Mardi Gras when the city’s main attraction, “Bourbon Street”, is completely closed to traffic and filled with millions of people. New Orleans is a city of great cuisine with a type of native food called Cajun. There are a history dating back to the 1700s, old cemeteries, tours of plantations, great shopping, and much more to see and to visit in New Orleans. 1. BCS, Southern Seaplane, Belle Chasse, United States. 2. BXA, George R Carr, Bogalusa, United States. 4. HUM, Terrebonne, Houma, United States. 5. NBG, NAS/Alvin Callendar, New Orleans, United States. 6. NEW, Lakefront, New Orleans, United States. 7. PCU, Pearl River County, Picayune, United States. 1. La Pavillion Hotel, 833 Poydras Street, New Orleans. 2. Iberville Suites, 910 Iberville Street, New Orleans. 3. Hotel St. Marie, 827 Toulouse St, New Orleans. 4. Prince Conti Hotel, 830 Conti, New Orleans. 5. Omni Royal Orleans Hotel, 621 Saint Louis Street, New Orleans. 6. Hotel Monteleone, 214 Royal Street, New Orleans. 7. The W New Orleans Hotel, 333 Poydras Street, New Orleans. 8. Astor Crowne Plaza, 739 Canal Street, New Orleans. 9. La Pavillion Hotel, 833 Poydras Street, New Orleans. 10. Omni Royal Orleans Hotel, 621 Saint Louis Street, New Orleans.